The October Photo Hunt over at Karma’s is about Idioms this month. I was a bit worried about it until I remembered I was going to Walt Disney World. Ideas started to come to me. I came up with two quickly, the third I found on the idiom list Karma linked to. I say this to myself when I am feeling down or things are not going my way. It is hard not feel good when one is above ground. What better way to show this then by visiting a graveyard like the one at the Haunted Mansion in the Magic Kingdom where all the denizens are below ground. 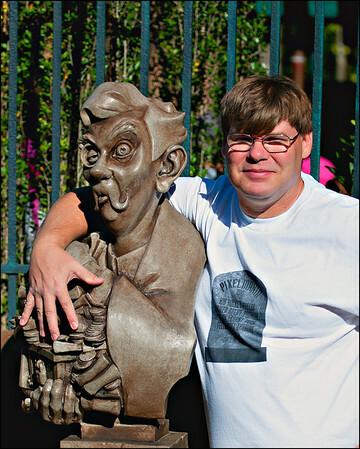 Scott is trying to get some of Uncle Jacob's money in the Haunted Mansion's new interactive queue. Obviously, Uncle Jacob did not understand he could not take his money with him. Darn if I could not pry it out of his cold, dead hands. At least, I am above ground! I have been known to have a little bit of a lead foot. Driving a sporty car tends to give one such a reputation. 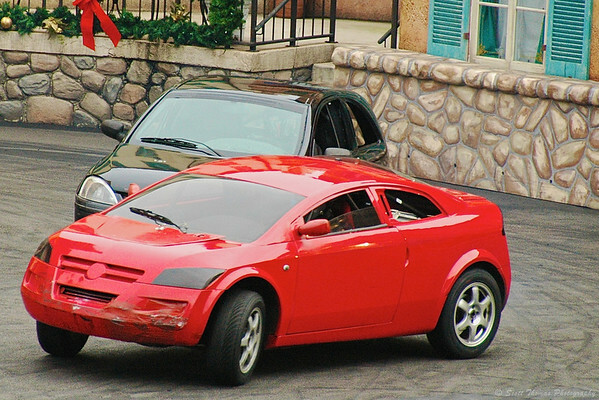 🙂 During the Lights, Motors, Action Extreme Stunt Show in Disney’s Hollywood Studios, the red Hero car is being chased by the bad guys in the black cars. Red Hero car being chased by the bad buys during the Lights, Motors, Action Extreme Stunt Show in Disney's Hollywood Studios. The hero definitely had his pedal to the metal and foot to the floor. Walt Disney was fond of reminding people that without Mickey Mouse, there would not have been Walt Disney Studios nor Disneyland. I found a tribute to this saying which has become an idiom in Walt Disney: One Man’s Dream at Disney’s Hollywood Studios. 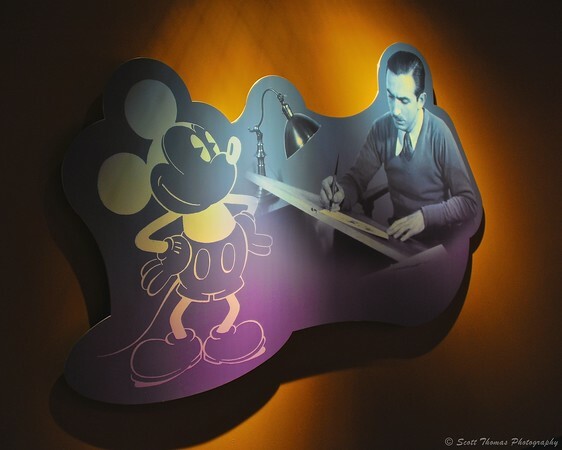 A young Walt Disney at work creating a Mickey Mouse cartoon on a wall display in One Man's Dream exhibit in Disney's Hollywood Studios. As I looked upon this display in the middle of the wonders of a park built years after his death, I had a new appreciation for what Mickey Mouse did for Walt’s legacy. Did you know there is a campground at Walt Disney World? It’s called Fort Wilderness. Each year during the Halloween celebration period, campers decorate their campsites for the holiday. 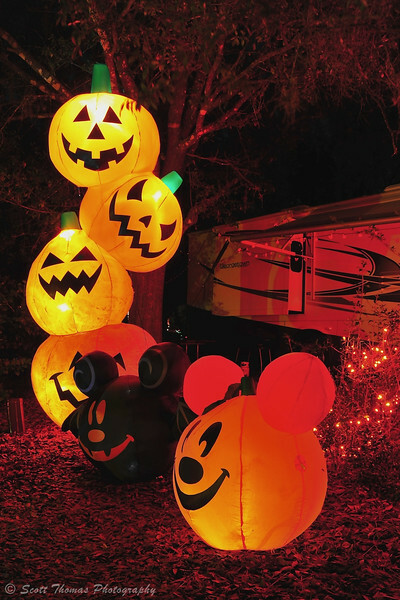 Disney style Halloween decorations at a campsite in the Fort Wilderness Resort and Campground. This entry was posted in Travel and tagged 28-300mm, bust, car, disney's hollywood studios, florida, graveyard, haunted mansion, hero, idiom, magic kingdom, mickey mouse, nikon D700, orlando, red, stunt show, vr, walt disney world. Bookmark the permalink. Thanks, Amy-Lynn! Disney is a great source of a lot of inspiration. Let’s hope the Texas Highway Patrol is not reading this blog. 😉 Thanks! I am new to the “Any day above ground …” idiom. Scott, great choice of idioms at Disney. You’ve made it seems so simple and here I’m still in the dark, I hope to come up with something by the 31st. I do love your Halloween image, it’s a great night shot. Those Mickey pumpkins are great! Love the pumpkins — and would have loved to see a photograph of “lead foot”! Your entry is a “smashing” success! And I am not referring to smashing pumpkins, which sometimes happens on the night before Halloween in this “neck of the woods”. I’m back! I love the Disney inspiration – and your choice of idioms, very cool! Those Mickey Mouse jack-o-lanterns are wonderful; I love them. Yeah! Must have been a tough without electricity since the storm. Hope your family came through it okay.